The copy editor who added this notice is listed in the page history. This page was last revised at 12:55, 18 April 2019 (UTC) (89 minutes ago) by Dhtwiki (talk · contribs) (Click here to refresh this time calculation.). Adams was a hyperactive child and prone to frequent sickness and hypochondria. He had few friends, but his family home and surroundings on the heights facing the Golden Gate provided ample childhood activities. He had little patience for games or sports, but enjoyed the beauty of nature from an early age, collecting bugs and exploring Lobos Creek all the way to Baker Beach and the sea cliffs leading to Lands End, "San Francisco's wildest and rockiest coast, a place strewn with shipwrecks and rife with landslides." Adams's father had a three-inch telescope; and they enthusiastically shared the hobby of amateur astronomy, visiting the Lick Observatory on Mount Hamilton together. His father later served as the paid secretary-treasurer of the Astronomical Society of the Pacific from 1925 to 1950. Adams was dismissed from several private schools for being restless and inattentive, so when he was 12 his father decided to remove him from school. For the next two years he was educated by private tutors, his aunt Mary, and his father. Mary was a devotee of Robert G. Ingersoll, a 19th-century agnostic and women's suffrage advocate, so Ingersoll's teachings were important to his upbringing. During the Panama–Pacific International Exposition in 1915, his father insisted that he spend part of each day studying the exhibits as part of his education. He eventually resumed, and completed, his formal education by attending the Mrs. Kate M. Wilkins Private School, graduating from the eighth grade on June 8, 1917. During his later years, he displayed his diploma in the guest bathroom of his home. Adams contracted the Spanish Flu during the 1918 flu pandemic, from which it took several weeks to recuperate. Reading a book about lepers, he became obsessed with cleanliness and was afraid to touch anything without immediately washing his hands afterwards. Over the objections of his doctor, he prevailed on his parents to take him back to Yosemite. The visit cured him of his disease and compulsions. While in Yosemite, Adams had need of a piano to practice on. 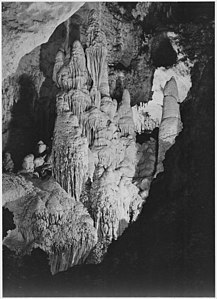 A ranger introduced him to landscape painter, Harry Best, who kept a studio home in Yosemite and lived there during the summers. Best allowed Adams to practice on their old square piano. Adams grew interested in Best's daughter Virginia and would later marry her. On her father's death in 1936, Virginia inherited the studio and continued to operate it until 1971. 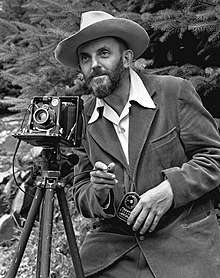 The studio is now known as the Ansel Adams Gallery and remains owned by the Adams family. 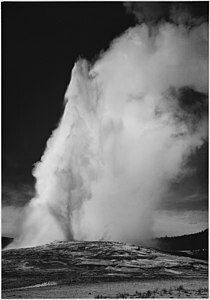 Adams was the recipient of three Guggenheim fellowships during his career, the first in 1946 to photograph every national park. 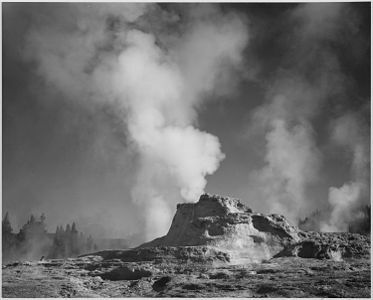 This series of photographs produced memorable images of Old Faithful Geyser, Grand Teton, and Mount McKinley. At that time, there were 28 national parks, and Adams photographed 27 of them, missing only Everglades National Park in Florida. 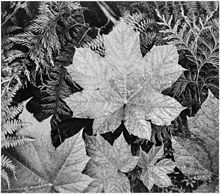 In 1945, Adams was asked to form the first fine art photography department at the San Francisco Art Institute. 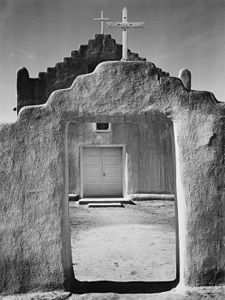 Adams invited Dorothea Lange, Imogen Cunningham and Edward Weston to be guest lecturers and Minor White to be main instructor. 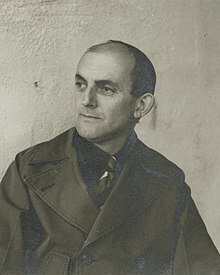 The photography department produced numerous notable photographers, including Philip Hyde, Benjamen Chinn, and Bill Heick. In 1952 Adams was one of the founders of the magazine Aperture, which was intended as a serious journal of photography displaying its best practitioners and newest innovations. 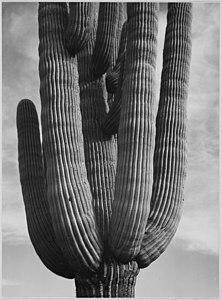 He was also a contributor to Arizona Highways, a photo-rich travel magazine. 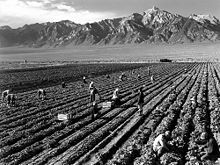 His article on Mission San Xavier del Bac, with text by longtime friend Nancy Newhall, was enlarged into a book published in 1954. This was the first of many collaborations with her. In June 1955, Adams began his annual workshops at Yosemite. They continued to 1981, attracting thousands of students. He continued with commercial assignments for another twenty years, and became a consultant with a monthly retainer for Polaroid Corporation, which was founded by good friend Edwin Land. He made thousands of photographs with Polaroid products, El Capitan, Winter, Sunrise (1968) being the one he considered most memorable. 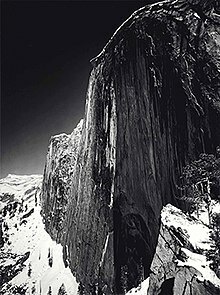 During the final twenty years of his life, the 6x6 cm medium format Hasselblad was his camera of choice, with Moon and Half Dome (1960) being his favorite photograph made with that marque of camera. 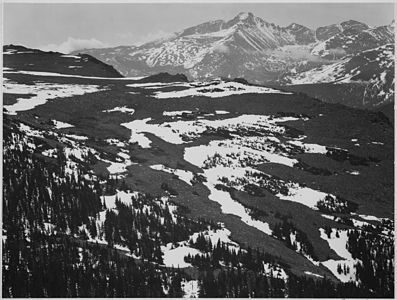 Adams published his fourth portfolio, What Majestic Word, in 1963, and dedicated it to the memory of his Sierra Club friend Russell Varian, who was a co-inventor of the klystron and who had died in 1959. The title was taken from the poem "Sand Dunes," by John Varian, Russell's father, and the fifteen photographs were accompanied by the writings of both John and Russell Varian. 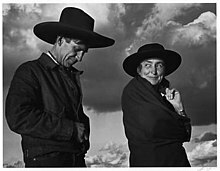 Russell's widow, Dorothy, wrote the preface, and explained that the photographs were selected to serve as interpretations of the character of Russell Varian. In the 1960s, a few mainstream art galleries (without a photographic emphasis), which originally would have considered photos unworthy of exhibit alongside fine paintings, decided to show Adams's images, particularly the former Kenmore Gallery in Philadelphia. 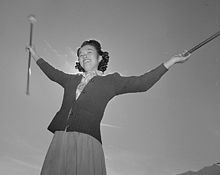 In March 1963, Ansel Adams and Nancy Newhall accepted a commission from Clark Kerr, the president of the University of California, to produce a series of photographs of the university's campuses to commemorate its centennial celebration. The collection, titled Fiat Lux after the university's motto, was published in 1967 and now resides in the Museum of Photography at the University of California, Riverside. 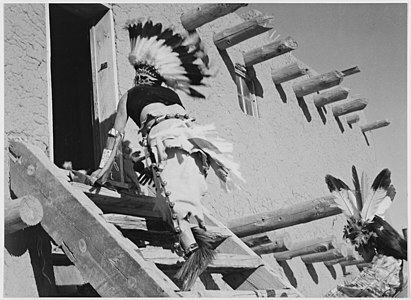 During the 1970s, Adams reprinted negatives from his vault in part to satisfy the great demand of art museums which had finally created departments of photography and desired his works. President Jimmy Carter commissioned him to make the first official portrait of a president made by a photograph. 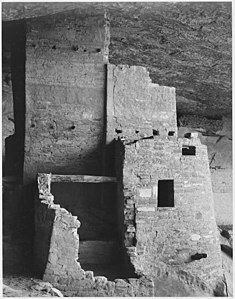 That year he also cofounded the Center for Creative Photography at the University of Arizona, which handles some of his estate matters. 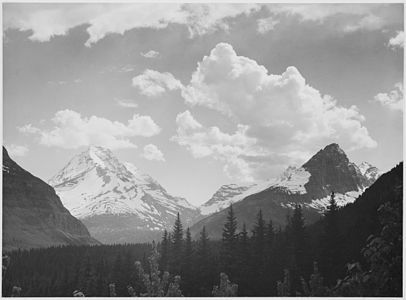 In 1955 Edward Steichen selected Adams's Mount Williamson for the world-touring Museum of Modern Art exhibition The Family of Man, which was seen by nine million visitors. At 10 by 12 feet (3.0 by 3.7 m), his was the largest print in the exhibition, presented floor-to-ceiling in a prominent position as the backdrop to the section "Relationships", as a reminder of the essential reliance of humanity on the soil. However, despite its striking and prominent display, Adams expressed displeasure at the "gross" enlargement and "poor" quality of the print. Group f.64 limits its members and invitational names to those workers who are striving to define photography as an art-form by a simple and direct presentation through purely photographic methods. The Group will show no work at any time that does not conform to its standards of pure photography. Pure photography is defined as possessing no qualities of technic [sic], composition or ideas, derivative of any other art-form. The production of the "Pictorialist," on the other hand, indicates a devotion to principles of art, which are directly related to painting and the graphic arts. 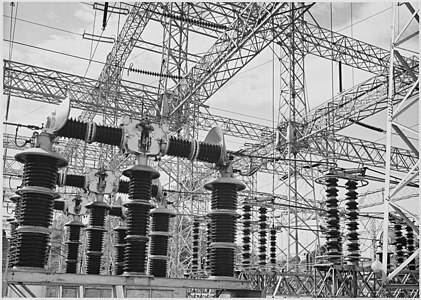 The members of Group F. 64 believe that Photography, as an art-form, must develop along lines defined by the actualities and limitations of the photographic medium, and must always remain independent of ideological conventions of art and aesthetics that are reminiscent of a period of culture antedating the growth of the medium itself. The f/64 school met with opposition from the pictorialists, particularly William Mortensen, who called their work "hard and brittle". Adams disliked the work of Mortensen and the person, referring to him as the "Anti-Christ". The purists were friends with prominent historians, and their influence led to the exclusion of Mortensen from histories of photography. While Adams and portrait photographer Fred Archer were teaching at the Art Center School in Los Angeles, around 1939-1940, they developed a system for managing the photographic process called the Zone System. It was based on sensitometry, the measurement of the sensitivity of photographic materials. These measurements determine the relationship between exposure time and the resulting density on a negative. The Zone System provides a calibrated scale of brightness in zones, from Zone 0 (black) through shades of gray to Zone X (white). The photographer can take light readings of key elements in a scene and use the Zone System to determine how the film must be exposed and developed to achieve the desired brightness or darkness. Although it originated with black-and-white sheet film, the Zone System is also applicable to roll film, both black-and-white and color, negative and reversal, and to digital photography. 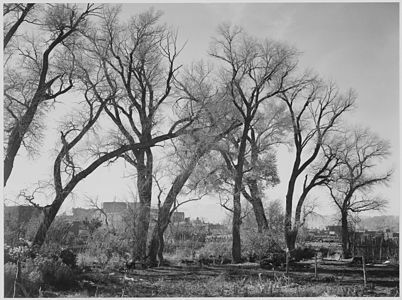 In 1940, with trustee David H. McAlpin and curator Beaumont Newhall, Adams helped establish the photography department at the Museum of Modern Art in New York. MoMA was the first major American art museum to establish a photography department. He acted as McAlpin and Newhall's primary advisor, and Peter Galassi, the chief curator of the department in later years, said "Adams's dedication and boundless energy were vital to the creation of the department and to its programs in its early years." For those who had sought institutional recognition for photography, the founding of the department was an important moment, marking the medium's recognition as a subject equal to painting and sculpture. Adams received a number of awards during his lifetime and posthumously, and several have been named in his honor. 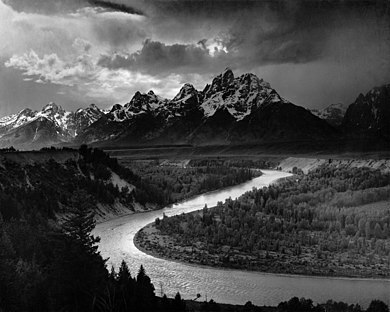 For his photography, Adams received the Hasselblad Award in 1981. Two of his photographs, The Tetons and the Snake River and a view of the Golden Gate Bridge from Baker Beach, were among the 115 images recorded on the Voyager Golden Record aboard the Voyager spacecraft. These images were selected to convey information about humans, plants and animals, and geological features of the Earth to a possible alien civilization. 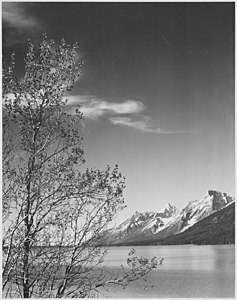 The Sierra Club's Ansel Adams Award for Conservation Photography was established in 1971, and the Ansel Adams Award for Conservation was established in 1980 by The Wilderness Society. 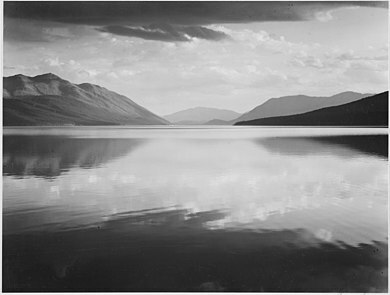 The Wilderness Society also has a large permanent gallery of his work on display at its Washington, D.C. headquarters. 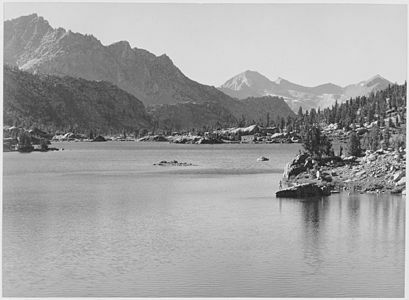 The Minarets Wilderness in the Inyo National Forest and a 11,760-foot (3,580 m) peak therein were renamed the Ansel Adams Wilderness and Mount Ansel Adams respectively in 1985. Adams was known mostly for his boldly printed, large format black-and-white images, but he also worked extensively with color. However, he preferred black-and-white photography, which he believed could be manipulated to produce a wide range of bold, expressive tones, and he felt constricted by the rigidity of the color process. Most of his color work was done on assignments, and he did not consider his color work to be important or expressive, even explicitly forbidding any posthumous exploitation of his color work.